Ilya Repin (Russian, 1844-1930) Portrait of Vasily Polenov, Detail (c. 1880) Oil on canvas. 80 BY 65CM. The State Tretyakov Gallery, Moscow. Vasily Polenov (Russian, 1844-1927) was 17 years old when Alexander II freed the serfs of Russia. The Tsar’s Emancipation Manifesto of 1861 was an acknowledgement of democratic changes in Western governments. The decree changed the political and economic landscape of Russia, forcing landowning aristocrats to pay for labor and contributing to a rising middle class. 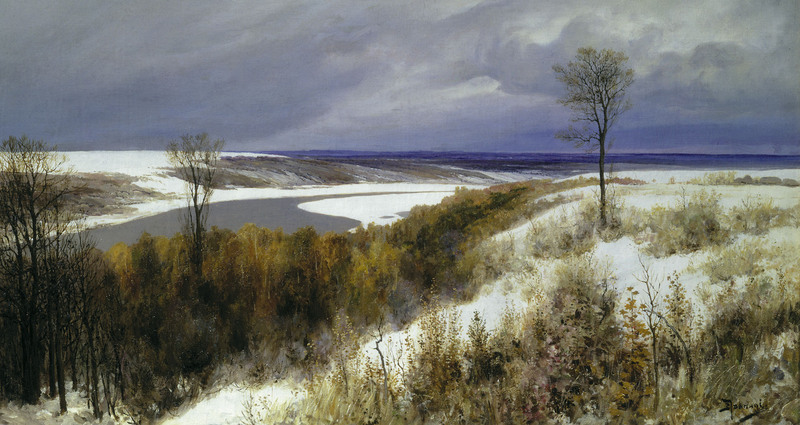 Vasily Polenov (Russian, 1844-1927) Early Snow (c. 1880) Oil on canvas.The social and economic changes in Russia spilled into the arts. Art academies in St. Petersburg and Moscow catered to the classical tastes of old Russia, represented by the aristrocracy. Shortly after the emancipation of the serfs, a group of artists, named Peredvizhniki, or The Wanderers, believed it was time “take art to the people.” With their first exhibition in 1870, The Wanderers rejected the classical ideals taught in official school in favor of Realism. They painted earthy, everyday peasants and took their exhibitions to rural areas of the country where a wider public could appreciate it. 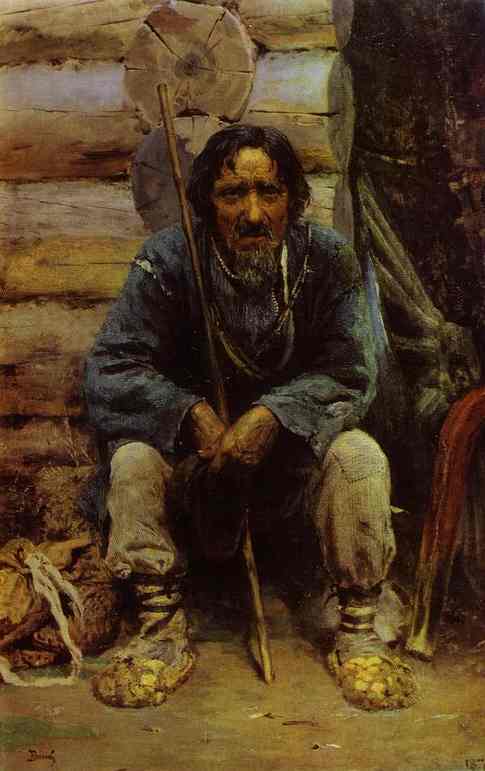 Vasily Polenov (Russian, 1844-1927) The Crippled Serf (c. 1878) Oil on canvas. 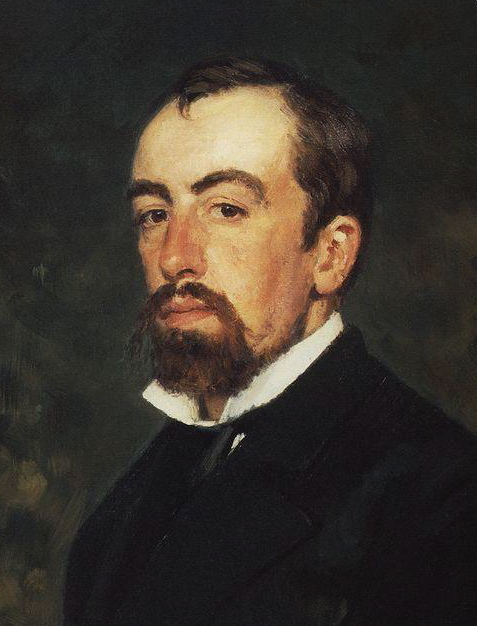 Polenov was an adopted as a member of The Wanderers, yet maintained his ties with the Russian Academy. He studied in the Imperial Academy of Arts in St. Petersburg from 1863-1871. 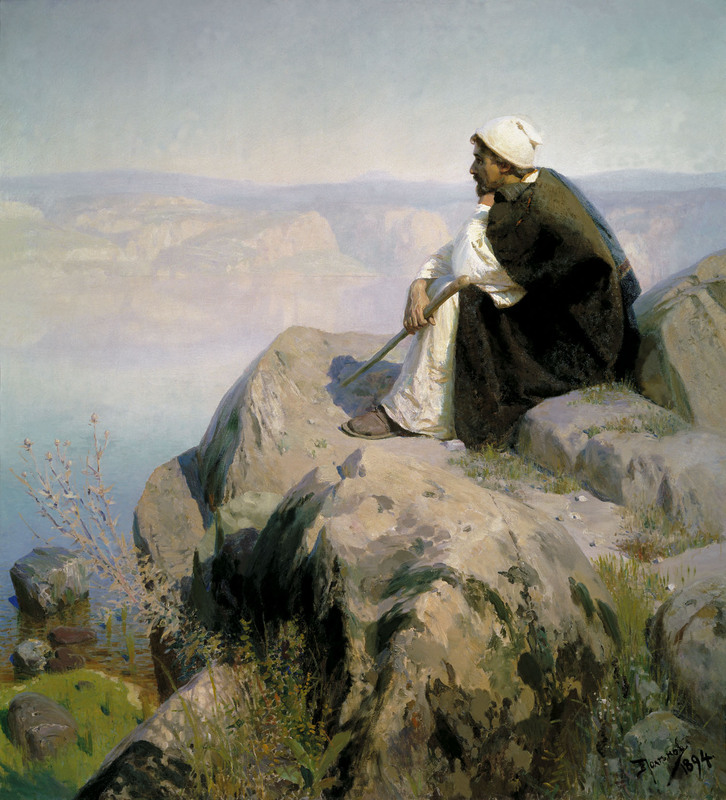 Polenov was perhaps the most traveled Russian artist of his generation. During his studies, he was pensioned in Italy and France, where he experienced first hand the contemporary movements of Realism and Impressionism. He returned with a love of plein air, and was one of the first to introduce the approach to other Russian painters. Using the technique he created numerous landscapes of his native countryside. 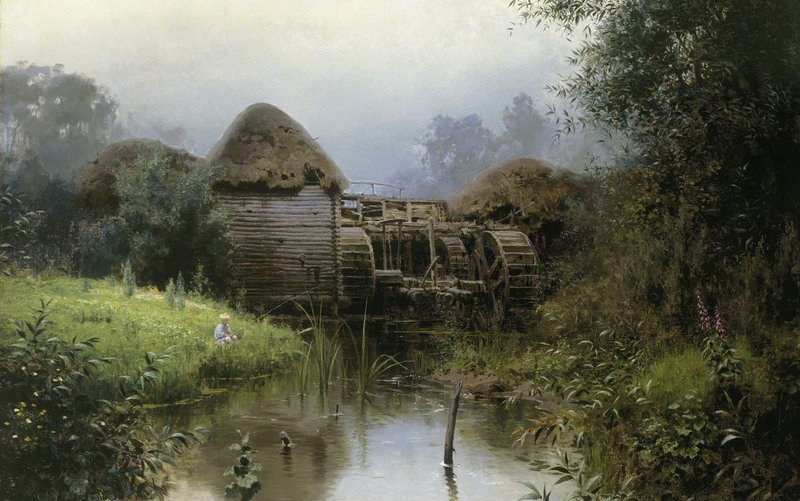 Vasily Polenov (Russian, 1844-1927) Old mill (1880) Oil on canvas. From 1877-1878, Polenov served as a military artist in the Russo-Turkish war. Shortly thereafter, he dedicated his work to religious scenes, especially from the New Testament. Vasily Polenov (Russian, 1844-1927) Christ and Woman Taken in Adultery (1886-1887) Oil on canvas. The State Tretyakov Gallery, Moscow. In preparation for the painting, Polenov had made sketches of people, architecture, and landscape in the Middle East and Greece, where he travelled from 1881-1882. 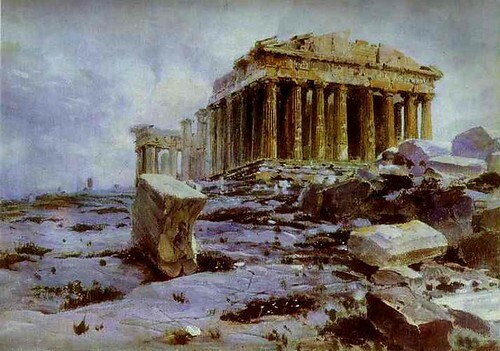 Vasily Polenov (Russian 1844-1927) The Parthenon, Temple of Athena Pallas (c. 1881) Oil on canvas. The Tretyakov Gallery, Moscow, Russia. 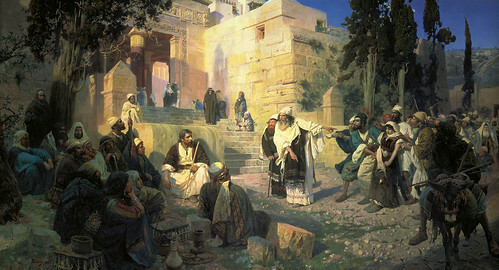 During his lifetime, Polenov was widely acclaimed for his work by both the Russian Academy and those that had broken from it. In 1893, he was made a fellow of the Imperial Academy of Arts in St. Petersburg, and taught at the Moscow School of Painting, Sculpture and Architecture until his death in 1893. Vasily Polenov (Russian, 1844-1927) Christ overlooking Jerusalem (c. 1885) Oil on canvas. The State Tretyakov Gallery, Moscow. Today, Polenov’s home in Borok, near Moscow, has been made a museum and placed in the national trust. You mention the influence of Realism and Impressionism, but the greatest affinity of the Wanderers has always struck me as with the Naturalists (Bastian-Lepage and company). I’m wondering if you know how aware the Russians were of this movement and vice versa, and if there was any direct cross-fertilizing, i.e. the stylistic spread through students and exhibitions that you might have read about or heard of? Ð¡Ð¿Ð°ÑÐ¸Ð±Ð¾ Ð·Ð° Ð¿Ð¾ÑÑ‚! Ð”Ð¾Ð±Ð°Ð²Ð¸Ð» Ð±Ð»Ð¾Ð³ Ð² RSS-Ñ€Ð¸Ð´ÐµÑ€, Ñ‚ÐµÐ¿ÐµÑ€ÑŒ Ñ‡Ð¸Ñ‚Ð°Ñ‚ÑŒ Ð±ÑƒÐ´Ñƒ Ñ€ÐµÐ³ÑƒÐ»ÑÑ€Ð½Ð¾..